So how are you all doing? My hubby and I got hit with something. I don’t know that it is/was the flu. I can’t tell the difference. Except to me, I always think of the flu as affecting your stomach and digestion. We haven’t had that, that I know of. So to me it was – is – more of a cold. I woke up with it on Saturday and I was miserable. So Saturday night when I went to bed I decided to try the wet sock treatment. Heard of it? You can read about it by clicking here (Wet Sock Treatment). I woke up feeling much better. I felt pretty good throughout the day, but just like with anything, was a little tired and worn out by Sunday night – even though I didn’t do anything. So I decided to do the treatment again Sunday night. Saturday night I didn’t last the entire night . . . well, the entire time I was in bed trying to sleep, with the socks on. They made me way to hot and I pulled them off in the early morning. I was so hot I was tossing and turning a bit. But that is what always happens to me when we have the heat on while I sleep. I just get way too hot. 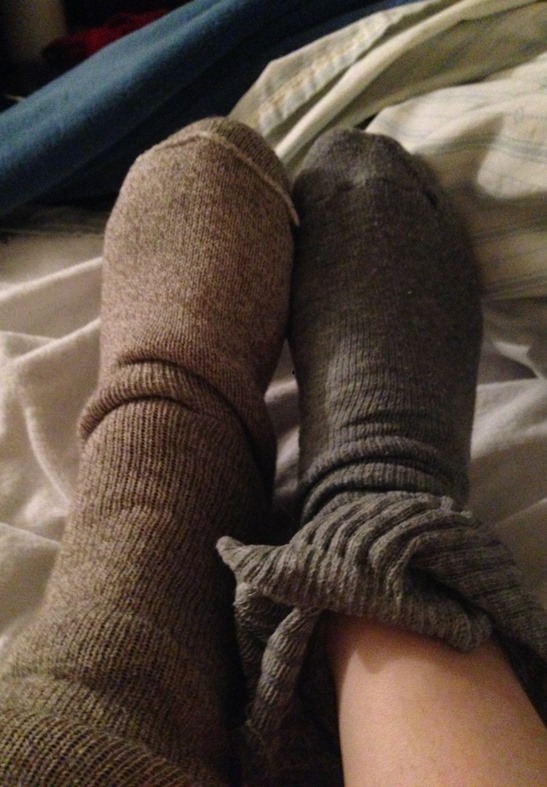 Sunday night I turned the heat down a bit and I was able to sleep with the socks on the entire night. AND I slept with my feet under the covers. Saturday night I kept putting my feet out because I was so hot. The heat just closes up my sinuses and makes me too hot. The first and last time I tried this was in 2011 and it wasn’t for a cold. It was for an injured toe. This time on Saturday night my feet were so cold I did warm them first, but not in warm water. I just used a space heater. The second night my feet weren’t cold so I just jumped to #3 and put the wet socks on and got in bed. I do think this treatment IS a good cold remedy and really helped me feel better faster. I think I am going to try it again tonight! I did think to look at my blog for the tea . . . . Sick People Tea . . . the one with lemon, ginger, and oregano . . . but I didn’t have any fresh ginger. I could have used powder, but I didn’t want to go outside to get a lemon. So I didn’t try the tea. But, I might still. I have to go outside tomorrow so I might pick a lemon on the way in. How are you holding out? What do you do to help speed your recovery along after the flu or a cold?